Summary of today’s show: St. Paul’s Choir School in Harvard Square is the only boys choir school in the United States continuing a centuries-old tradition that began in Europe. The 50-year-old school’s choir has performed throughout the country and the world, including recently performing for Pope Francis in Rome. Scot Landry interviews John Robinson, the Music Director of St. Paul’s Choir School, as well as students and parents, including a family that moved from Virginia so their son could attend, and we hear the live musical performances. Today’s guest(s): Mr. John Robinson, Mark Flynn (7th Grade), Christian Landry (6th Grade), Thomas Potts (6th Grade), Colin Lapus (5th Grade), Mike Flynn (Mark’s father), Karen Donnellan (Thomas’ mother) and Maureen Lapus (Colin’s mother). In its 50th year, Saint Paul’s Choir School has formed and educated boys in grades four through eight in the rich music tradition of the Roman Catholic Church. The Choir School seeks to embrace the great cathedral school tradition as it unites a rigorous musical and academic curriculum with our Catholic faith and moral tradition preparing each student to grow and flourish in a dynamic and changing world. The 15th Annual Gala Dinner to benefit St. Paul’s Choir School in Harvard Square, Cambridge, takes place on Saturday, April 5 at the Cambridge Marriott. 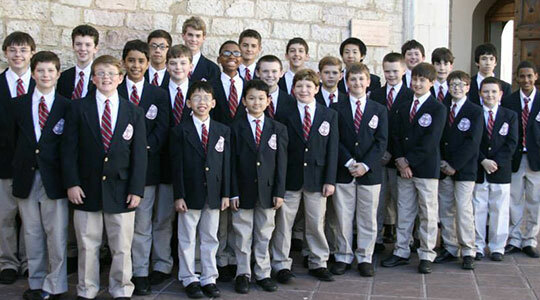 St. Paul’s has the only boys Catholic choir school in the United States. The school is fresh off a singing tour in Italy and recently performing with the Vienna Boys Choir. The entire boys’ choir will perform a selection of light songs from their repertoire. The Back Bay Brass Quintet will also perform. The school will also be recognizing the dedication and commitment of several individuals who have been instrumental to the success of the school during its first fifty years.